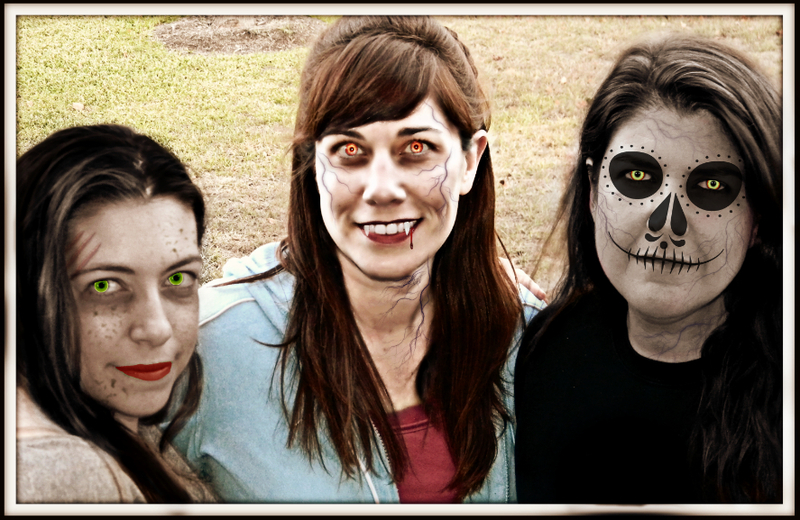 That’s what to you get when you combine good friends, a photo, and PicMonkey. I was going to save this for Halloween, but I have to share the creepy now! The site is super easy to use. (Thanks to Kristen Lamb for telling me about it!) Just upload your pictures and start playing. The witch (Rachel) needed a gray complexion, pock marks, and witchy eyes. (I love the eye effects!) Black hair and a gray streak finished the look. Uh, no. Something was missing. In the standard editing area, we found the perfect lip color (make the color as subtle, or not as you want). Something was still missing. I tried a Frankenstein-type scar across her forehead, but then she suggested that this witch had a fight with a werewolf (and won, by the way). The clawed scar over her eye was the perfect touch. With a smile like that, Shannon had to be a vampire. Have some fangs, sister, to go with that well-fed complexion and the brilliant eyes. The fangs were the hardest to get right. Nothing cutesy here. Don’t you think the veins add just the right touch? The Day of the Dead settings looked too fun not to use them on my own face. I tried to make myself purple (seriously, you can pick any color! ), but I didn’t look deadly at all. Shannon nixed the purple right away because I looked cute–if a purple skullhead person can look not scary. A pale gray complexion replaced the red one that replaced the original purple one. I learned about layers and how the undo option works. You can’t undo an area after you move on to another area without undo-ing each step in between. I promise that my hair isn’t really that gray. A few pale veins on the bone complexion made the effect deeper. Don’t you just want to smile back at me? That’s my Halloween costume this year–right there in that picture. It was a fun weekend with two of my close friends (I have more traveling stories about these two) and our friend Deb, who joined us briefly but left before I thought about this picture. *Scrapbooking at a fabulous crafters bed and breakfast doesn’t mean I have to scrapbook. 🙂 It’s just easier to tell people that’s where I’m going. Need to work on the back garden beds to get ready for more planting. It was too cold this weekend. Work out and eat better. Food does not define me, especially after two weekends away. After a glorious weekend of research, I have rearranged my middle grade WIP outline and written 5k words. Now, time to finish the draft (perhaps a mini NaNoWriMo? ).